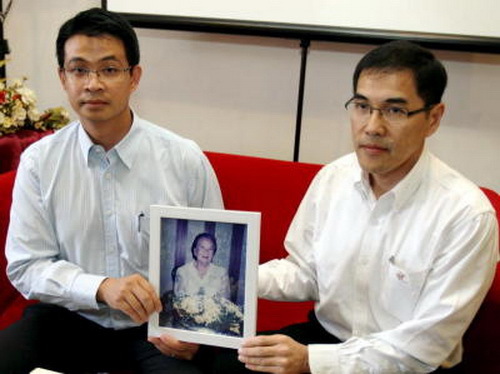 Justice not served: Cousins Piya (left) and Prithep Sosothikul with a picture of their late grandmother, Boonsom Boonyanit. The police have to explain their tardiness in investigating the most infamous land forgery case in Malaysia. This is a heart-rending story, a story about an incessant quest for justice by three generations of a Thai family. 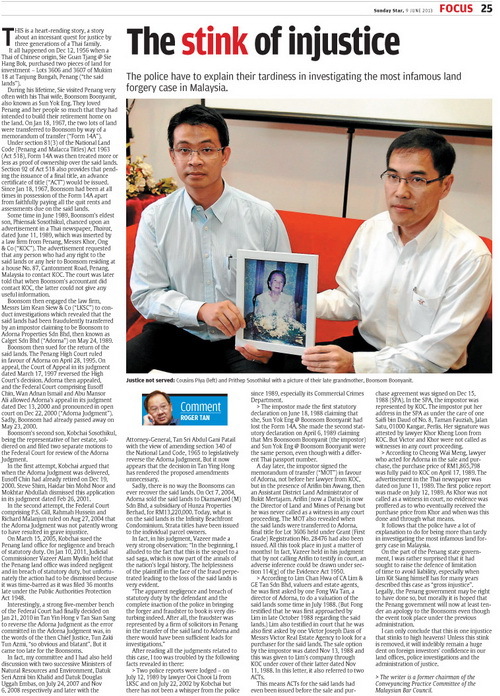 > Two police reports were lodged – on July 12, 1989 by lawyer Ooi Chooi Li from LKSC and on July 22, 2002 by Kobchai but there has not been a whisper from the police since 1989, especially its Commercial Crimes Department. > The impostor made the first statutory declaration on June 18, 1988 claiming that she, Sun Yok Eng @ Boonsom Boonyanit had lost the Form 14A. She made the second statutory declaration on April 6, 1989 claiming that Mrs Boonsoom Boonyanit (the impostor) and Sun Yok Eng @ Boonsom Boonyanit were the same person, even though with a different Thai passport number. > According to Lim Chan Hwa of CA Lim & GE Tan Sdn Bhd, valuers and estate agents, he was first asked by one Fong Wa Tan, a director of Adorna, to do a valuation of the said lands some time in July 1988. (But Fong testified that he was first approached by Lim in late October 1988 regarding the said lands.) Lim also testified in court that he was also first asked by one Victor Joseph Dass of Messrs Victor Real Estate Agency to look for a purchaser for the said lands. The sale option by the impostor was dated Nov 13, 1988 and this was given to Lim’s company through KOC under cover of their latter dated Nov 11, 1988. In this letter, it also referred to two ACTs. > According to Cheong Wai Meng, lawyer who acted for Adorna in the sale and purchase, the purchase price of RM1,865,798 was fully paid to KOC on April 17, 1989. The advertisement in the Thai newspaper was dated on June 11, 1989. The first police report was made on July 12, 1989. As Khor was not called as a witness in court, no evidence was proffered as to who eventually received the purchase price from Khor and when was this done and through what means.